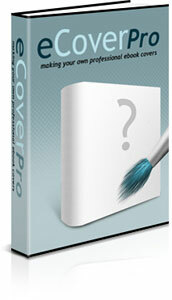 Find out how YOU can easily churn out one professional eCover after another for every new product you have and feel sorry for others who didn’t discover this easy, low-cost alternative which can be responsible for saving themselves hundreds of dollars from feeding hungry, greedy graphic designers or buying expensive eCover Creator Tools that don’t give you desired results! You have just completed your newest digital product and it is almost ready to enter the Internet marketplace. Almost ready… yeah, right. The Internet marketplace completely saturated with many other digital products, thus making your product stand out of the crowd is sure going to be a challenge. Suffice to say, the first impression counts. With prospects waiting to be customers on the Internet, they can’t touch or feel anything digital in nature let alone taking a peek into them! And the first impression is so crucial, it can very well be the deciding factor between YOUR product and your competitor’s. Since your prospect can’t even get the icing of the cake and that he has to choose ONLY ONE product, which one would he choose? The most expensive-looking one, of course, price-to-price or not. You certainly DON’T want to lose a lot of potential sales simply owing to lousy-looking eCovers you use for your product no matter how good your sales letter may be, because the bottom-line is that your prospects are seeing your digital product at a glance, and it takes a good 5 seconds for your prospect to either stay or turn away. Another school of taught says that if you’re going to be in business, dress in a business manner! After all, dressing your product well by giving it a professional looking eCover goes to show how serious you take your business and your prospects will be able to tell that, consciously or not. Look, the truth is that, we’d like to buy what we CAN see, though digital products can’t be touched or felt, unlike tangible products. Hire a Graphic Designer. You can hire a graphic designer to get the job done for you… that is if you don’t mind forking out at least $99 for having one professional eCover done for you. And that is only ONE. You might or might not have the money to afford a graphic designer. And if you need to have some adjustments made to the eCover, it might cost extra on your part to have the same graphic designer make any changes to the eCover. I don’t think this what you REALLY want, right? Let’s check out your next option. Get a Tool or Software that creates eCovers for you. You can create an unlimited number of eCovers with such leverage that you suspect these wicked tools are ready to put graphic designers out of their job! But the question is: can you produce PROFESSIONAL eCovers that you’ve been wanting so badly? Whether you like it or not, you still need to have a certain degree of graphic designing skills to utilize eCover Creating Programs. In addition, more often than not, you will just NOT like the results you get from using these programs. I know it because I’ve used it myself before. Create Your Own Professional eCovers With Photoshop! Easily Create Multiple Professional eCovers With Photoshop Only – No Third Party Software Or Plug-ins Needed! … because in my manual, I give you the “brains” of a professional graphics designer, presented to you in layman’s terms, which is ideal especially if you’re not a techie person by nature. And most importantly, I show you how you can easily make your own expensive-looking eCover in just a few minutes (not more than an hour).